New ideas for baby gear are popping up on the daily, and one of the newer trends are teething necklaces, or chewelry, as we like to call them. Teething necklaces can have multiple uses; some are amber necklaces meant to be worn by babies where the amber is absorbed through the skin while others are for direct mouthing and are worn by parents. Both are safe options and more natural alternatives to over the counter medication as long as baby is being supervised at all times. No matter your preference, we’ve rounded up some top choices for many types of teething necklaces to ease your decision so you have more time to soothe your teething munchkin. This teething necklace is a best seller, and for many reasons. Powell’s Owls Amber Teething Necklace is made from high quality, chemical-free Amber beads that are made off the Baltic Coast in Lithuania. It is one of the only teething necklaces that has verified authentic Amber beads by the Gemological Institute of America. Amber is known for its anti-inflammatory and calming properties due to succinic acid. This necklace is not meant for mouthing but is absorbed through the skin to ease pain, inflammation, and irritation during nasty teething episodes. Not only is Amber good baby’s body, but Powell’s Owls made sure this necklace was safe by utilizing double-knotted beads and an extra-secure screw clasp. This necklace is meant to be worn around the neck while supervised and wrapped around the ankle during naps or bedtime. Its trendy earthy look keeps your baby stylin’ even when they’re feeling like a hot mess. Also, parents get a bonus silicone pendant necklace to wear to satisfy your little one’s mouthy curiosity as well as super cute packaging. Powell’s Owls is so confident that this Amber necklace will work that they put a lifetime guarantee on their necklaces. 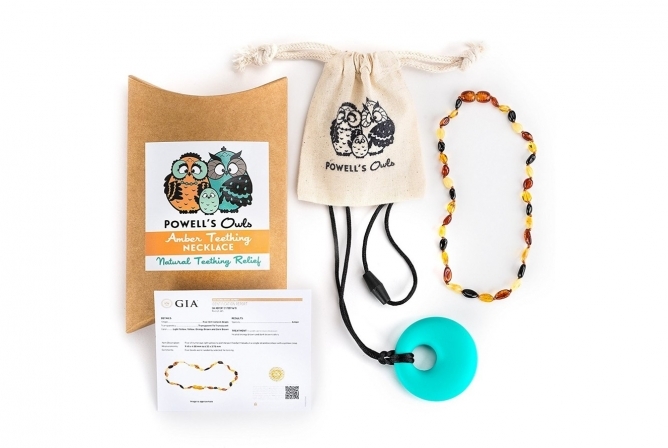 Powell’s Owls Amber Necklace MSRP is $29.99, but check the current Powell’s Owls Amber Teething Necklace – Amazon price. Bebe By Me (now known as Marotaro) has a top selling necklace that is not only perfect for teething but is a fashion statement for mom as well. It has multiple kinds of beads that are different shapes, textures, and colors that promote sensory development while still massaging and soothing sensitive gums. This necklace has two separate cords with a breakaway clasp for safety and is meant to be only worn by mom only. A couple of cool features are that the Harper Necklace is freezer safe and machine washable. It is also unique to other necklaces because the silicone beads have multiple textures – “hard, soft, and cushy” all in the same necklace. The silicone is also high-end food-grade silicone that is toxin and BPA-free. As always, baby should be supervised at all times while playing with the necklace. The MSRP is $21, but click here to find the current Bebe By Me Harper Teething Necklace – Amazon price. If you’re looking for a simple but serious fashion statement, Pretty Mom & Lovely Baby has a few teething necklaces for you. The Snowball Designer Teething Necklace, however, has a classic and timeless look but still offers some awesome features for both mom and baby. For baby, there are multiple different textures to play with including a knitted bead, natural wooden beads, and food-grade silicone beads. It is free of BPA, PVC, Phthalate, Cadmium, lead, or any heavy metals because baby’s safety is of utmost importance to this cute little company. It’s also easy to clean with soap and water and has an easy to use clasp in the back for quick application and taking off for mom. It is meant to be only worn by mom, and babies should always be supervised when playing with this necklace, just like any teething necklace on the market. MSRP for the Snowball Teething Necklace is $27 but check out the Snowball Designer Teething Necklace – Amazon price right now. The Teether Rainbow Silicone Teething Necklace is a versatile option for families not into amber teething necklaces. This necklace is meant to be worn by mom or baby and is made of 100% food-grade silicone. The purpose for this necklace is for direct use, to be mouthed and played with by baby during teething time. The Teether necklace is fully FDA & CPSIA compliant and is free of: BPA, PVC, Pthalate, Cadmium, Nitrosamine, Lead, and Latex. Bright contrasting colors provide great visual stimulation for baby. This necklace is also easy to clean with soap and water and is also dishwasher safe. Another great use for this necklace is to use for distraction and play during breastfeeding. Even though there is a breakaway clasp with this necklace, it should still be used with direct supervision. The MSRP is $24 but check the Teether Rainbow Silicone Teething Necklace – Amazon price here. Very similar to Powell’s Owls Amber Necklace (above), Baltic Wonder produces a high-quality Amber teething necklace that reduces inflammation and pain in the gums during teething episodes. 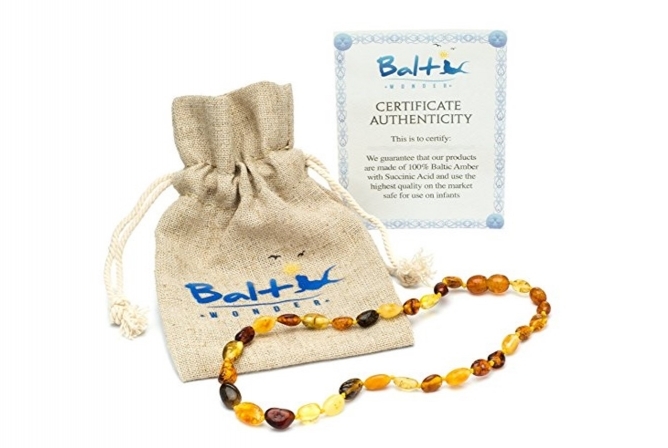 The Baltic Wonder Amber Teething Necklace is worn by baby as the Amber is absorbed through the skin. The Amber made by Baltic Wonder is also made in the Baltic Region and is a safe alternative to over the counter medications. This necklace is double knotted between each Amber bead and each bead is smooth so that it doesn’t irritate baby’s skin. The clasp for the Baltic Wonder Amber Teething Necklace is a twist on so that it isn’t easily removed by baby, but it should be said that babies should be supervised at all times when wearing this necklace. During sleep, the necklace can be worn around the ankle for continued benefits. Not only is the Baltic Wonder necklace safe and effective, it’ll look cute on your baby, too! With many different color options (Amber color doesn’t determine effectiveness), you can choose the best look for your cute little munchkin. With an MSRP of $19.99, check the Baltic Wonder Amber Teething Necklace – Amazon price here. Depending on your wishes for your baby and their teething experience, finding the best option is important for your family and the teething experience. The biggest thing we as parents want to do is take our precious babies’ pain away, but some times that’s just not possible. 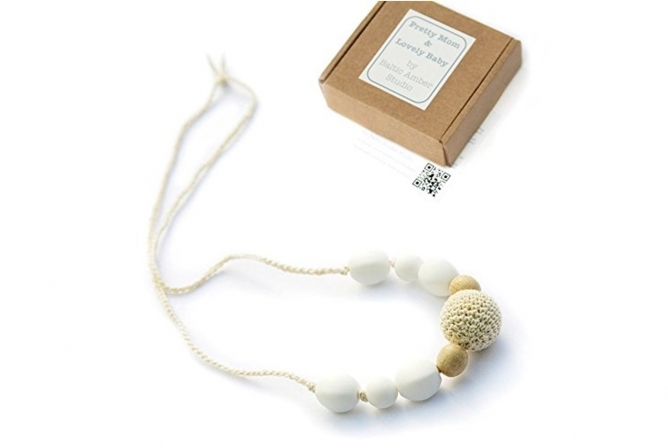 Teething necklaces provide a great alternative and natural solution to teething episodes and provide a great distraction and possibly a better experience for everyone involved. If baby isn’t happy, nobody’s happy!